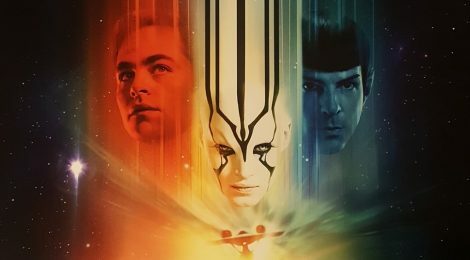 Movie Review - Star Trek Beyond - Honk if you love justice! I’ve got a bit of a love/hate relationship with the “Kelvin-verse” Star Trek movies. I really like the cast, and have come to grips with the fact that, since it’s not a TV show, the movies need to shade a bit more to the action side of things than the more cerebral Trek episodes. Still, the first two movies (especially Star Trek Into Darkness) made some really painful story choices and had me looking at Star Trek Beyond with a bit of trepidation. I’m happy to report that Star Trek Beyond was pretty darn great, and definitely my favorite of the three so far. I think what works here more than the previous two movies is, you actually feel like these individuals have come together as a crew. There are quiet moments of contemplation and camaraderie mixed in with the action beats and it just makes it feel more like Star Trek. I could actually believe this crew having to deal with some of the stranger stuff from the original series, like Trelaine or Apollo or planets where everybody talks like a gangster. Beyond follow this crew right in the middle of their 5 year mission, with Kirk handling a diplomatic exchange between two warring races. Unlike what we’re used to with Picard, it does not go well. “I ripped my shirt again,” Kirk laments at one point in a tongue-in-cheek moment. He feels a bit lost, which makes sense as this version of Kirk didn’t have his Starfleet dad to watch and look up to his whole life. It isn’t uncommon, you know? It’s easy to get lost. In the vastness of space, there’s only yourself, your ship, your crew. This line comes from Commodore Paris, played by Shohreh Aghdashloo of The Expanse, as Kirk discusses taking a desk job with her. This is a different spin on the original cast movies, with Admiral Kirk leaving the desk job behind to get out and make a difference in the galaxy again. Pine’s Kirk is chafing under the monotony of a five year mission, feeling ‘episodic’ (:wink:) and having trouble with the idea that you never really reach a destination out in the vastness of space. It also works as a counterpoint to the villain, who was sent out into space himself (remaining vague so as not to spoil things) and was broken by it. I loved the character beats between the leads, it felt very much like the classic series Kirk/Spock/McCoy interactions. Sofia Boutella’s Jaylah fit in fairly well, and I liked that they didn’t shoehorn in some romantic subplot just because they were adding a female lead. If there’s one thing that bothered me about Beyond, it’s that 20-21st century music played a role again. Yeah, it was a callback to the first movie but it felt a bit out of place then and it still does now. Minor quibble, though, to be sure. If you are a Trek fan but were turned off by Star Trek Into Darkness, give Star Trek Beyond a try. I think you’ll be pleasantly surprised.